Water source Blairgar Burn which runs from the Campsie Hills (soft water). Stills 1 x wash still and 2 x spirit stills. The Glengoyne Distillery is situated in a wooded valley in the southern Highlands of Scotland close to a small river that flows into the famous Loch Lomond. The distillery, which takes its name from “Glen Guin” or Glen of the Wild Geese, has been producing an exceptional single malt scotch whisky for nearly 200 years. Like all malt whiskies the highest quality barley is soaked in water and spread out on the floor of the malthouse and turned regularly. Usually once germination has taken place it is dried using the smoke from peat fires which imparts an aromatic smoky flavour to the drying malt. However, the Glengoyne distillery is different as it uses only barley that has been dried using warm air. Once dried the malted barley is ground into 'grist' and mixed with the crystal clear, soft water off Dumgoyne Hill in a mash tun. The resultant liquid or 'wort' is then passed into one of six large wooden washbacks made from traditional Oregon pine where yeast is added to convert the malt sugars into alcohol. Fermentation then takes place for a period of between 40 - 50 hours. When this process is complete the liquid or 'wash' as it is now called is distilled (we nurse the spirit through our stills more slowly than any other distillery for a smoother taste) to produce the spirit that will mature slowly in oak casks to become the high quality Glengoyne Single Malt. Glengoyne 10 Years Old Unlike most other single malts Glengoyne has been preserving the essence of its flavour for decades by using air-dried barley rather than barley dried using harsh peat smoke. The result is a more subtle, complex whisky in which all of the delicate flavours are freely allowed to express themselves. 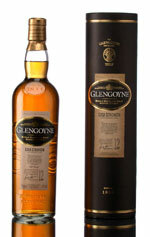 Glengoyne 12 Years Old Discover the real taste of single malt. Distilled from air-dried barley without peat smoke, and using the soft, pure local water, this unique whisky is bottled unchill-filtered at cask strength to preserve its natural flavour. 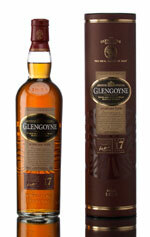 Glengoyne 17 Years Old Glengoyne's distinctive style carries on improving with age. The same elements are present at 17 years old as they were at 10, only now the balance has artfully changed. A more concentrated, equally well-balanced palate of flavours has emerged, though it still retains the same clean, delicate taste as the 10 Years Old. 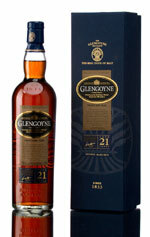 Glengoyne 21 Years Old Another four years in the cask sees Glengoyne 21 Years Old achieve the optimum balance of flavours and the maximum benefits from the wood. Glengoyne 1972 The year 1972 was a significant year in our history - the pocket calculator was invented, Nike sold its first pair of running shoes and Glengoyne laid down some exquisite casks of their Highland Single Malt for maturation. These have now been bottled and are ready for sale! 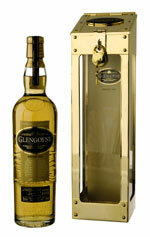 The final character of this special malt is affected by the wood of the cask in which it matures. Glengoyne carefully selects the highest quality Spanish and American oak casks (some of which will have been seasoned with Sherry in Spain before shipping to Scotland) from which this malt slowly extracts unique flavours during the ten years or more in which it is maturing in the distillery's dark airy warehouses. The milder climate of the southern Highlands effects the maturing whisky over time and results in the fresher lighter taste associated with this special malt. Mouthfeel: Warming. Initial Taste: Clean. Green apples and grass with a hint of sweet liquorice. After Water: Sweeter. Linseed oil and almonds. 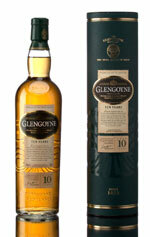 Comments: Great introduction to Glengoyne range. Nose: Oak, sherry, digestive biscuits, sweet oatcakes, banana, apricot, peaches, marzipan and peardrops. Does not prick the nose, despite high strength. Mouthfeel: Viscous, rich and filling. Initial Taste: Smooth, sweet start, with some sherry and chocolate. After Water: Becomes slightly waxy, with pepper at the tail. Finish: Very long, stays with you until morning! Initial taste: Malty, treacle, slightly nutty. Orange peel, apple compot. Rich oak. Comments: Multi award winning dram. One of the greats. Possibly the best pound for pound dram on the market. Nose: Red apples, toffee, sherry, spicy strudel. Mouthfeel: Coating. Initial Taste: Lots of Sherry, honey, oak with a developing aromatic sensation. Ends with a heavenly cinnamon nip. Comments: Glengoyne 21 now achieves the optimum balance of flavours and the maximum benefits from our specially selected 100% first fill European Oak Sherry casks. Appearance: A natural pale, yet bright Imperial gold. The light syrupy smoothness creates slowly forming legs on the glass which slowly meander. Nose: The fruitiness of bananas, sweeties and fruit punch combine with the rich, yet subtle floral notes of apple blossom and elderflower, followed by nectarine and grapefruit with hints of vanilla pod and dry oak wood. Taste/body: Light and syrup smooth at first with hints of liquorice and a spicy sweetness, followed by a ladder of delicate lemon peel and light cashew to reach new heights with an explosion of rich honeycomb sweetness and light oak. The aftertaste is dry and sweet, leading to an almond bitterness and aniseed. Finish: A medium to long dry, lingering finish which is sweet and mouth warming, followed by glazed orange and sweet kaki. A delightfully rich candy concoction. 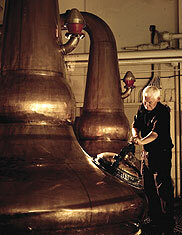 It is the lack of harsh peat smoke to dry the barley which has the greatest effect on the final malt . It ensures that the natural flavours are allowed to freely express themselves and do not get overwhelmed. Additionally, all our whiskies are of natural colour. Glengoyne could be considered to be at one end of the malt whisky spectrum - clear, bright, subtle, complex yet delicate a contrast to the rugged malts of the northen Highlands or the pungent, medicinal heavy malts of Islay. Admission charge From £5.50 depending on the tour type selected. Comments All tours start on the hour. More than 10 people, by arrangement in advance. (Phone in advance for Christmas – New Year opening hours).